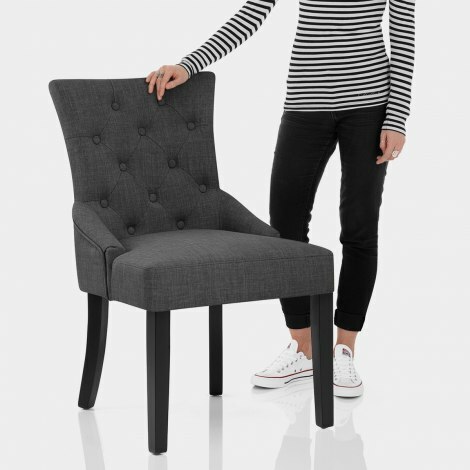 Make a statement with the Verdi Chair Grey, a luxury model with first class comfort and an uncompromised look. Ideal for use in the dining room, lounge, bedroom, and beyond, the Verdi is a splendidly versatile design that simply cannot be ignored. 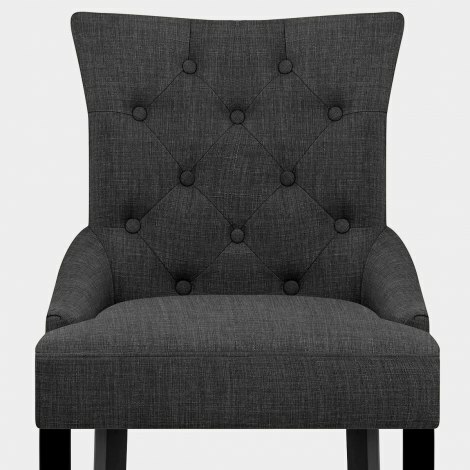 Upholstered in charcoal grey fabric, the supportive seat is sprung and belted for quality comfort, whilst the padded backrest boasts sumptuous button detailing and gracefully curving sides for a truly lavish look. Set on a solid wooden frame with a divine black finish, the four sturdy legs provide a strong and stable base. Each leg is also finished with a protective floor plug. "This chair is ideal. Stylish and comfortable"
The colour goes so well in our newly re-decorated rooms. They are great quality, really sturdy and very comfortable. Really easy to put together and arrived no problems the day after order. Very comfortable dining chairs. Well made and sturdy too. The fabric is attractive and a soft brush removes any crumbs or dust. We bought the Verdi Chairs to replace traditional solid wood chairs as arthritis makes sitting on hard surfaces for more than a few minutes uncomfortable. The Verdi Chairs in dark grey fit in well with our colour scheme and have received compliments from our friends. Definitely good value for money and certainly look as though they should have been a lot more expensive. Well done Atlantic Shopping. Really lovely chairs for a very reasonable price. We’ve used them as dining chairs but are they very versatile. I needed something fast for a home office. I ordered this chair in the evening and it arrived the next day!! A huge breath of fresh air from other sites of experiences I’ve had where I’ve been waiting literally months for a product to arrive. Very reasonable price, fantastic quality, and wonderful customer service! Couldn’t be happier with my purchase! Chairs arrived quickly, easy to assemble, very sturdy and seem well made look great highly recommend.